Just another routine visit. Dr. B placed the spring on the right lower side instead of the left lower side to help close another small gap. I guess he thought the lower left didn’t warrant a spring this time. I almost walked out of the office when he took a second look and thought he could do better for me (at first it was just brackets, elastic ligatures, and archwire). 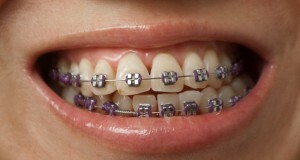 I asked for purple elastics this time just because I was in a purple mood. Last Saturday DH, Stella, and I visited with DH’s family in Connecticut. His Aunt Anne asked how long I’ve had my braces and I answered her with the exact date to her amazement. Everyone seemed to be watching me struggle a little to cut corn on the cob with a knife (trying hard not to chop my fingers off); an excuse for gaucheness when one has braces. Tonight my right side lowers around the spring feel a little achy. I’m glad this started after dinner and not before. It’s not too bad. Tomorrow should be better. One more day and I can celebrate my 1 year Braces Anniversary! Wow, I almost can’t believe it. I can’t wait until I can whiten my teeth and figure out what to do regarding the right upper recession (would have to seek the advice of an oral surgeon if I decide to have the area fixed). P.S. I have on Essence of Beauty Lip Frosting in Strawberry Cheesecake (available at CVS) and really like it.